Designed to replace the crystal oscillator LO chains for microwave receivers and transmitters for the 1296 MHz band. Now there is an alternative to those unstable high frequency crystal oscillators which drift constantly, allowing precise receiver/transmitter frequency settings using a stable external 10 MHz or 100 MHz reference oscillator like a TCXO, Oven Controlled Oscillator or a Rubidium Oscillator. 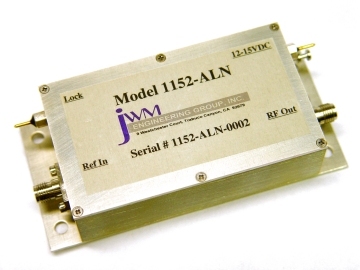 The Model 1152 outputs a single ultra low noise 1152 MHz signal. With a minimum of +17 dBm of output power, the Model 1152-ALN is perfect for driving 3-dB power spliiters, high level mixers and power amplifier stages. The ultra low noise performance of the Model 1152-ALN begins to approach crystal oscillator phase noise performance. This allows the Model 1152-ALN to be used for such things as EME communications, long-haul low noise communications and digital operations like JT65 and similar modes. With both end of a communications link using a Model 1152-ALN, both stations will be absolutly on the same frequency when locked to a 10 MHz GPS disiplined oscillator reference. No more hunting around the dial for the other operator.